Kansas City, Mo. 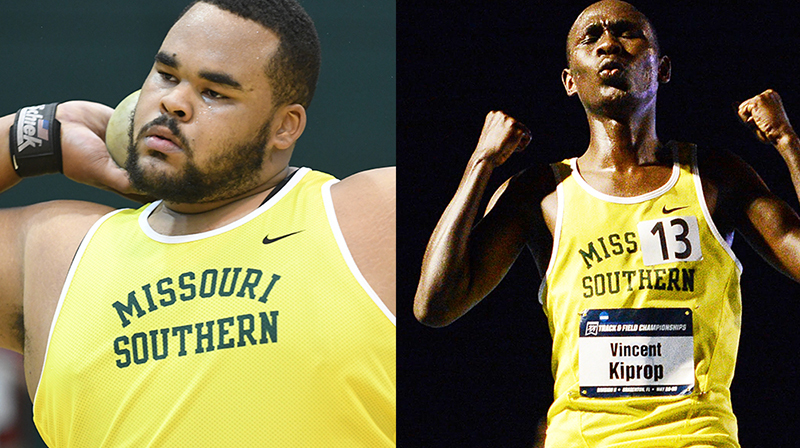 — For the second time this season, the Missouri Southern men’s track and field team has swept the MIAA’s Athletes of the Week honors as Vincent Kiprop and Bryan Burns take home this week’s honors. Kiprop, a sophomore from Kericho, Kenya, had a night to remember as the Kenyan broke his own school record in the 10,000 meters at the Mt. Sac Relays in California. Kiprop won the 10k elite race in a time of 28:19.95, which is more than a minute faster than his previous record that was set on this very track a year ago. The time is an NCAA automatic qualifying time, is tops in Division II by 31 seconds, is the fourth-fastest time in the NCAA this year (any division) and is the 11th-fastest time in the world this year, according to the IAAF. The time is also the seventh-fastest time ever in Division II in the 10k. Kiprop destroyed the competition that included mostly professional and Division I runners and won the event by nearly ten seconds. Kiprop is the reigning NCAA Division II 10k champion, indoor 5k champion and cross country champion. Burns, a junior from Carthage, set a new school record and punched his ticket to nationals as the mens track and field team competed at Pittsburg State this past weekend. Burns hit an NCAA automatic qualifying mark of 184-06 in the discus, breaking the previous school record by two feet set two years ago. The mark is third nationally and tops in the MIAA this season. In other action, Burns placed 10th in the hammer throw and was second in the shot put with a provisional distance of 56-08.50. The Lions will be in action this week with the squad traveling to three different locations including the KU Relays, Missouri S&T and the University of Arkansas.